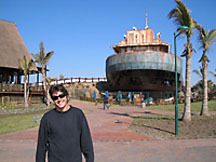 Gareth Pike is an advertising copywriter, freelance journalist and editor living in Durban, South Africa. After a stint in London in 2004, he returned to South Africa to resume a career in advertising. His interests are amaryllis plants, great white sharks and environmental causes. Gareth is about to turn 30 but has already had his mid-life crisis, so is not stressed.